Volunteers in white coveralls, hard hats and masks poked through ash-covered debris Sunday, searching for the remains of victims of the devastating Northern California wildfire before rains that are forecast for this week complicate their efforts. While the rain could help tamp down the blaze that has killed at least 77 people, it also could wash away telltale fragments of bone, or turn loose, dry ash into a thick paste that would frustrate the search. The members of the team — one of several involved in the search — scrutinized the rubble in five-minute sweeps, using sticks to move aside debris and focused on vehicles, bathtubs and what was left of mattresses. When no remains were found, they spray-painted a large, orange "0" near the house. Robert Panak, a volunteer on a different search and recovery team from Napa County, spent the morning searching homes, but didn't find any remains. Asked whether the job was tough, the 50-year-old volunteer said, "I just think about the positives, bringing relief to the families, closure." The number of people unaccounted for dropped to about 1,000, authorities said late Sunday. Authorities stressed that many of the people on the list may be safe and unaware they have been reported missing. "As much as I wish that we could get through all of this before the rains come, I don't know if that's possible," he said. Honea said it was within the "realm of possibility" that officials would never know the exact death toll from the blaze. Among them was Lolene Rios, 56, whose son, Jed, tearfully told KXTV in Sacramento that his mother had an "endless amount of love" for him. President Donald Trump toured the area Saturday, joined by California's outgoing and incoming governors, both Democrats who have traded sharp barbs with the Republican administration. Trump also visited Southern California, where firefighters were making progress on a wildfire that tore through communities west of Los Angeles from Thousand Oaks to Malibu, killing three people. "We've never seen anything like this in California; we've never seen anything like this yet. It's like total devastation," Trump said as he stood amid the ruins of Paradise and pledged the full support of the federal government. "He's got our back," outgoing Gov. Jerry Brown said Sunday on CBS' "Face the Nation." "There have been some back and forth between California leaders and the president" Brown said. "But in the face of tragedy, people tend to rise above some of their lesser propensities. So I think we're on a good path." He also suggested California's severe wildfires will make believers of even the most ardent climate change skeptics ``in less than five years,'' and that those living near forests might need to build underground shelters to protect them from fires. 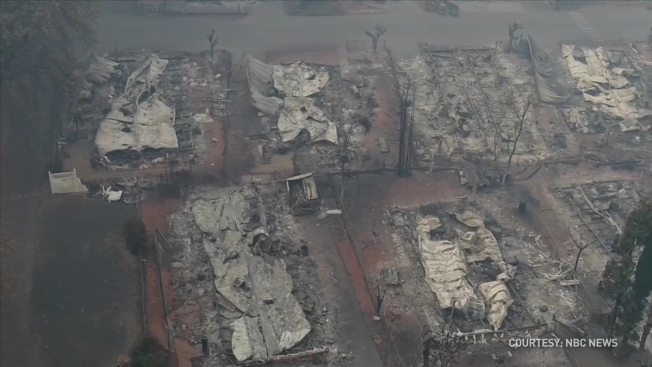 Northern California's Camp Fire has destroyed nearly 10,000 homes and torched 233 square miles. It was 60 percent contained.